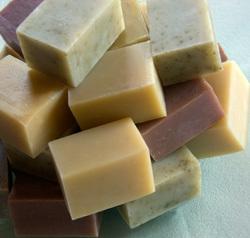 Pamela Soap specializes in customer orders for special events such as weddings and showers. Labels can be personalized to make these a very unique favor to the delight of your guests. Graphic design services available! Please enquire by email for more information. Handmade soap with your custom label and size is a perfect way to promote your business. Pamela Soap can create a label or use your existing identity for your very own line of handmade natural fresh soap. Wholesale quantities and pricing available. Please enquire by email for more information.